Today I’ll be reviewing one of my favorite Sunscreen Lotion with Moisturizer,Lotus Herbals Sandalscreen Sandalwood Sunscreen Lotion with Moisturizer. Product Claims : Protects skin from harmful effects of UVA and UVB rays of sun. The unique formula of sandalwood, cuscus grass, sweet basil and honey shields the skin from atmospheric pollution besides revitalizing and nourishing. Product claims to be for all skin types. Direction for use : Can be used any time of the day, be it in the morning before applying make-up or in the evening after removing makeup. Moisturizer comes in light yellow color pump dispenser bottle. The pump dispenser dispenses always right amount of product in just single pump. I love this kind of packaging which is very easy to use and hygienic. The packaging is travel friendly too. The product has slightly creamy in consistency and very light on skin. It gets blended into the skin very easily. It has an amazing sandal fragrance which I find quite refreshing that lingers on for an hour. This Moisturizer has sunscreen lotion, so I use it for day time moisturizing. After taking bath I need only double pump of this lotion, which is enough for entire face and neck application. It leaves my skin soft and smooth without any greasy or oily feel. I've noticed one thing that this lotion easily suite on my skin in all seasons. It's a very good thing about this product. It does not make my skin tight or uncomfortable in the winter. During the summer, it gives a perfect moisturizing balance on skin. Though it has the sunscreen properties but I never used it for outside. I think its moisturizing effect is quite effective then sunscreen part. It does not have any SPF factored in it. So I doubt how it will protect skin from sunburn. The Sunscreen Lotion with Moisturizer lasts for more than 4 hours. The bottle will last long for more than 3 month or little more as only small amount is needed at a time. My husband also likes to use this product every day so it would hardly last for 3 months for me. Frankly speaking, I could not find any bad thing about this product. I am using this lotion for a long time now and it suits on my dry, combination skin and I can use it in all session, so what could be better than that. However, I have one thing to say that I do not use this product as a sunscreen lotion. Because, there is no mention of SPF. Overall, Lotus Herbals Sandalscreen Sandalwood Sunscreen Lotion with Moisturizer is one of the effective moisturizer for all skin types especially for dry to combination skin. Those who have oily skin they should also give a try. It has a light creamy texture and absorbs quickly. I highly recommended this product as a Moisturizer not as a sunscreen. Yes, I would buy this product again and again. I've already finished 3 to 4 bottles. 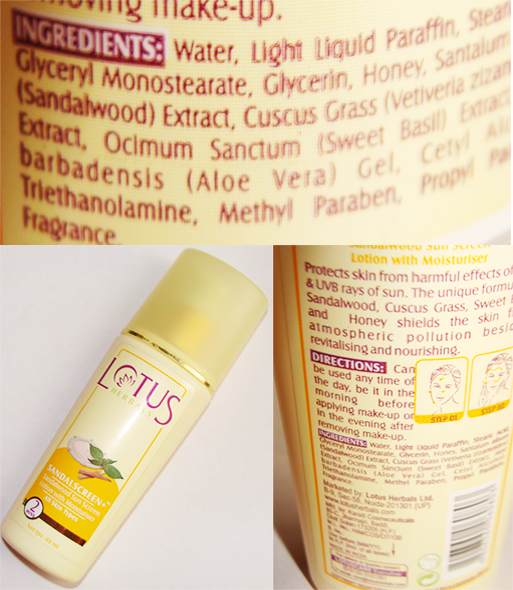 Have you tried Lotus Herbals Sandalscreen Sandalwood Sunscreen Lotion with Moisturizer ?